Tonight we created recipe cards at the Stampin’ Sistas workshop. The recipes were supplied by the hostess, Teresa. They belonged to her grandmother and she wanted to preserve them in a fun way for herself and gifts to family members this Christmas. We scanned them in her grandmother’s handwriting, touched them up slightly, reduced them, and printed directly to Stampin’ Up cardstock. They turned out lovely and everyone had a great time. Have you been planning for your Christmas cards and gifts? Now is the time! I find the gifts and cards began in October are almost always finished. When I wait until December to begin, they often are a next year’s birthday gift because there isn’t time to complete it all. I’m booking holiday cards and gifts workshops all next month. Hurry and get your date on the books. As a bonus for booking a workshop in October, you will receive a custom designed Christmas card for your family using the stamp set of your choice, patterns for 10 elegant easy holiday cards, your choice of two of the 10 as make and takes for your workshop, and a free hostess gift. If you have been giving some thought to a workshop, now is the time. These bonus items are in addition to the perks being offered through Stampin’ Up. Here is the final card of the three card set. This one features the snowflake of Best Wishes and More. This was a free set we received at regionals last year. There are so many blessings involved in a partnership with Stampin’ Up. Don’t you want to participate? I would love to answer any questions you might have. Just send me an email or leave a comment here. To create this one, I stamped the snowflake in Versamark on Very Vanilla, sprinkled with heat and stick powder, heated, covered with iridescent powder, and finally heat set again. They were cut out with paper snips and attached with dimensionals and glue dots. The quilt was constructed similiarly with the change of the finished edge. This one was finished with paper binding in Garden Green. I cut the Garden Green 3/4″ larger than the quilt (4 11/16″ x 4 11/16″), scored 1/4″ from the edge, cut the corners off, and stitched down over quilt edges to form binding. 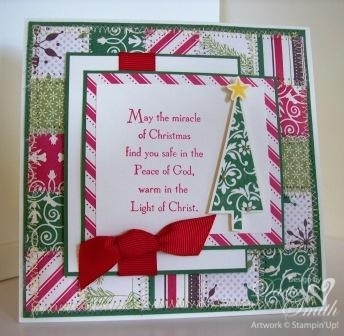 The card base is 5 1/4″ x 5 1/4″, the Merry Moments designer paper is 5 1/8″ x 5 1/8″, and the Real Red is 4 7/16″ x 4 7/16″. The patchwork Christmas card was so much fun yesterday, I decided to give it a whirl today and complete a three card set for my hostess. This year’s holiday mini is filled with so many beautiful sets, it was hard to choose which to feature next. I decided to use the hostess set Patterned Pines, this could be hers with a $150.00 workshop. 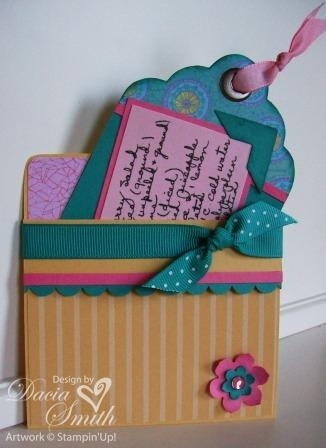 All feature the designer paper Merry Moments. It creates wonderful cards and projects. There were several questions about how yesterday’s card was achieved. I’ll attempt to explain it again. Begin by cutting 9 squares 1 5/16″ each taping them together to form a quilt. 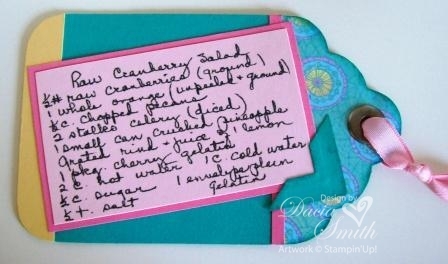 Next cut a 3 5/8″ x 3 5/8″ piece of quilt batting and attach this to the back of the paper quilt with tape. 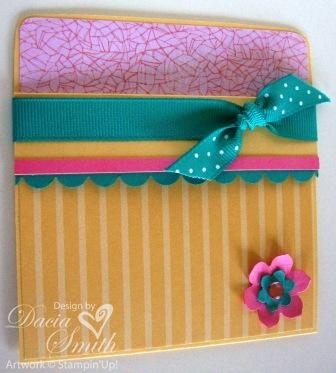 Then layer it to 4 1/8″ x 4 1/8″ Garden Green cardstock and stitch at the seams. Distress 10, 1 5/16″ squares on all four sides and cut diagonally across. Attach 5 triangles to each side with snail. Finally stitch around outside edge of quilt attaching each triangle. The quilt was mounted on 5 1/8″ x 5 1/8″ Garden Green cardstock and the card base was 5 1/4″ x 5 1/4″ Very Vanilla. If it is still unclear, send me an email ,and I will try again. Well without further delay, this is card two and my share for today. Hope you’ll stop by tomorrow for the final card in the set. Hope you’ll have fun making a few quilt cards of your own! Life here has been difficult and I have had to put my stamping on the back burner for a little while. I have only been able to do the bare necessities to keep my monthly groups going. Boy I sure have missed spending time creating in my craft room. Last week things began to slow down, so I have had the time to put together a post for today. 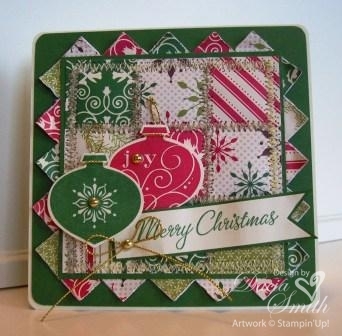 My Stampin’ Sistas group wants to do quilt cards next month. One of the gals is a quilter, and has created beautiful quilts for the sistas. They are gorgeous and I am in awe of her work. The plan next month is to share ideas of how she can marry the two crafts and have some fun! Do you think this one will inspire her to get busy with a Christmas idea or two? I placed quilt batting between the two layers of cardstock and sewed at the seams. Each square is puffy and it really looks like a quilt. The ruffle squares around the quilt bottom were distressed and folded up a bit. The card is 5 1/4″ square and is my first attempt at stitching a card. There are so many inspiring ideas out there, I just had to give it a try. It was lots of fun and I plan to make several more to share next month. Hope you enjoy! Trusting you have a wonderful weekend!